The state has issued fines against three San Franciso-area startups for not gaining licenses for services they don't offer. Proving that even the nation's most tehnologically-savvy sector has outdated bureaucrats. 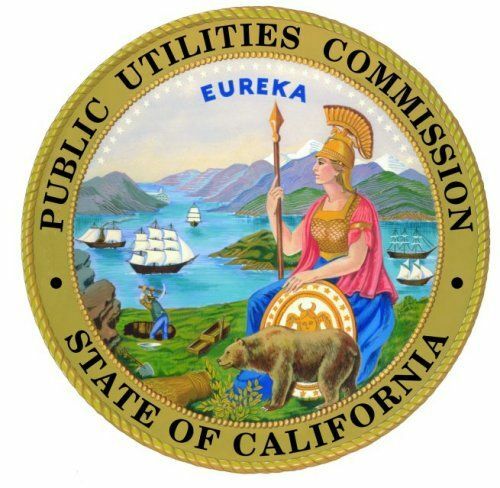 If the seal of the California Public Utilities Commission (at right) is taken at face value, it's apparent that the bureaucrats in the CPUC take the imagery it shows seriously. "Got an idea that's beyond horse and buggy times? Too bad, we have regulations against that." Three new startups in the San Francisco Bay area have new ideas for transportation. Lyft and SideCar are ride-sharing match-makers which pair people driving to a particular location at a particular time with people who want a ride to that place at that time. Think of them as the online version of the college "hitchhiker's board" where 3x5 cards were used to match drivers with passengers for road trips. Uber is a similar idea, but more of an on-demand taxi service as people could use the site to find "fares" to shuttle around in order to make extra cash and keep a fleet busy. SideCar and Lyft received fines from the CPUC for $20,000 each for "operating an unlicensed charter-party business." The regulations requiring licensing for that type of service, however, are geared towards companies that own fleets and/or pay independent drivers for limousine and party chartering. Neither SideCar nor Lyft owns a fleet or employs any drivers. They merely facilitate the connection between someone who's going somewhere and someone who needs a ride there - and the payment the rider makes to get the ride. SideCar has retained AOL-famous lawyer David Phillips to fight the regulators, whom they say are out of touch and are attempting to stuff SideCar into an irrelevant category much like regulators attempted to stuff America OnLine into a existing, but irrelevant, categories when they first introduced the Internet to the masses (right after Al Gore invented it). Lyft says that not only is the attempt bogus, but if it weren't, the company's vetting process for drivers (which includes background checks and Motor Vehicle Records checks) are more strict than those required by CPUC for a charter service. Which says something about those regulations that "keep us safe." Uber, of course, is a slightly different animal. It doesn't own a fleet either, but it does facilitate a sort of taxi on-demand service. The service, however, is mostly connecting licensed charter services with passengers. This would mean that if the California regulations apply to it, they would be double-regulated and taxed, putting it at a disadvantage. Most of its users are companies whose drivers are sitting idle and the company offers an easy way to both track the drivers (via GPS) and their fares as well as make those connections easily, saving time and money and keeping a fleet moving rather than idling. For Uber, this follows on a cease-and-desist order that the CPUC issued to them when they first started a few years ago, but that has since been dropped as Uber proved it was not operating illegally. The fines were issued alongside cease-and-desist orders for both Lyft and SideCar, reports TechCrunch. That's what happens when we elect people who can't manage budgets and rely on coming down hard on us entrepreneurs in order to keep afloat an economy based on outdated models. And yes, somehow we're the 8th largest global economy, down three points since 2006. Go figure! Here's what really slays me. Where I live, you can literally paint "TAXI" on the side of your car, go get a chauffeur's license (just a simple written test and $15), add on some liability coverage and BAM, you're in business. Most of these "regulations" and "rules" for professional services are just protectionist scams. I am still concerned about whether taxis in San Francisco are able to operate without uninsured motorist coverage and no air bags. Yet California does not seem to want to do anything about these safety issues but rather go after more road safety vehicles.